‘Panarchy’ is a new term coined from the name of the Greek god Pan, a symbol of universal nature and associated with unpredictable change. It represents an alternative framework for managing the issues that emerge from the interaction between people and nature. That interaction generates countless surprises, often the result of slow changes that can accumulate and unexpectedly flip an ecosystem or an economy into a qualitatively different state. That state may be not only impoverished, but also effectively irreversible. Thus, understanding how such change occurs is critical to achieving a sustainable society. Developed from the work of the Resilience Alliance, a worldwide group of leading organizations and individuals involved in ecological and economic research, Panarchy provides a framework to understand the cycles of change in complex systems and to gauge if, when, and how they can be influenced. This synopsis introduces lay readers and decision makers to this widely acclaimed line of inquiry and to the basic concept behind Panarchy, published by Island Press. "Resilience, timing, adaptation—these are the three pillars upon which the emergent properties of interacting systems rest. When the systems are the economy and the environment, understanding of the relationships among these concepts is crucial. This volume does a better job of explaining how to manage both money and nature to ensure humanity's long-term future than any other work I know of. Read and reflect." 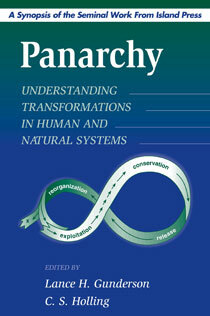 John L. Casti, Santa Fe Institute, and Technical University of Vienna, in praise of "Panarchy"
"This is a book that should be read, or at least dipped into, by anyone concerned with the sustainable management of ecosystems—whether for conservation or other goals—through teaching, study, or active practice. It will make any reader think and, hopefully, reconsider how he or she understands the diverse systems within which 'nature' and people interact at many different scales." Martin F. Price, Centre for Mountain Studies, Perth College, UK, in praise of "Panarchy"
Chapter 10. How Do Human and Natural Systems Differ?